Buzzed haircuts for women are a great option if you want to make a statement, are undergoing medical treatment and want to deal with hair loss on your own terms, or just want plain change. Britney Spears did it, Sinead O'Connor rebelled, and Natalie Portman proved to women all over the world that buzzed haircuts for women can be beautiful. 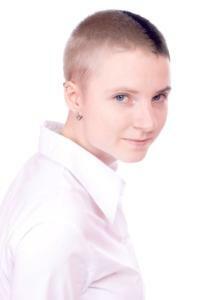 Often women shave their head for a fashion statement. Tired of a bad hair days or the daily struggles of fitting in with a certain hair type or hair color, women take the clippers and go to town, all while feeling completely liberated and free from society's demands. Although many have witnessed train wreck buzz cuts, where gals have lost control and took the rage out on their hair, there have been many women who have worn a fashionable buzzed look for a purely unique fashion statement. Before you take the most risqué of hair plunges and buzz your head, consider that the average head of hair grows at a rate of a half an inch per month. In one year, you can expect your outgrowth after the buzz to be about four to five inches long. Unless you're comfortable with short hair, a buzz cut will be a long term commitment you may quickly grow tired of. On the other hand, rest assured that the sun will set, taxes will be paid, and hair will grow. Wigs are a great option for life after the buzz, and hair wraps can disguise patchy hair on patients undergoing chemotherapy or radiation treatment who are dealing with the hair loss. Often, friends and family members will show their support of cancer victims they love by taking the clippers to their own scalps. A gesture that is not only heartfelt, it continues to prove that at the end of the day, hair is just hair. If you're debating a buzz cut, consider the options on both sides. Buzz cuts require zilch styling time. Wash the scalp, and you can go! Accessories such as scarves, wigs, hats, and turbans can disguise your buzz whenever the need or the fancy strikes. Buzzed hair is a great option if you suffer from heat flashes and need less hair to keep you cool. Buzz cuts also send the message that you aren't afraid of what people think, and that's a trait that's not only cool, but universally coveted. Don't expect that you can take the clippers to a full head of hair without enduring painful pulling and tugging on your scalp. It is best to get hair down to a manageable length prior to taking the buzz plunge. Hair should be about one inch long before the final buzz takes place. Do you need a stylist? If you've got a set of clippers or hair trimmers, most likely not. As long as you can cut your hair to the manageable pre-shave length, you can handle the clippers on your own. Tip: Make sure your press firmly on the scalp and follow the natural curve of the head as you shave. Use a mirror to get the backside of the scalp, and most importantly, tuck your ears foreword as you shave near this tender area. Because of peer pressure or a "dare"
Buzzed hair can work on anyone who chooses to wear it, and buzzed haircuts for women can be stylish and show power and confidence. Are they flattering? Well, let's just say beauty is always in the eye of the beholder, and there's something pretty tough about a gal who doesn't need a head of hair to look hot.